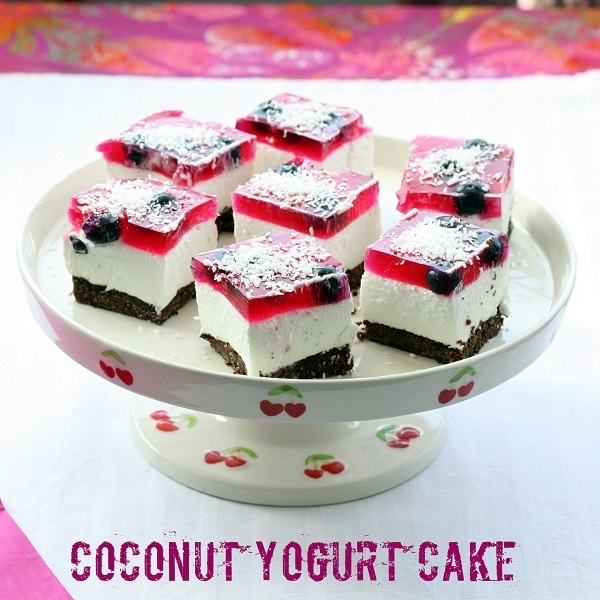 As a big fun of coconut I’m always happy to experiment with this ingredient. 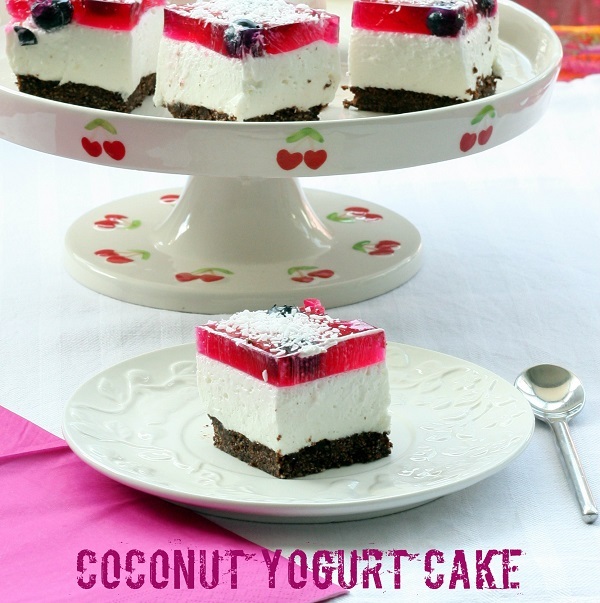 Its low carb and perfect for diabetic baking and cooking. This cake is simply delicious. 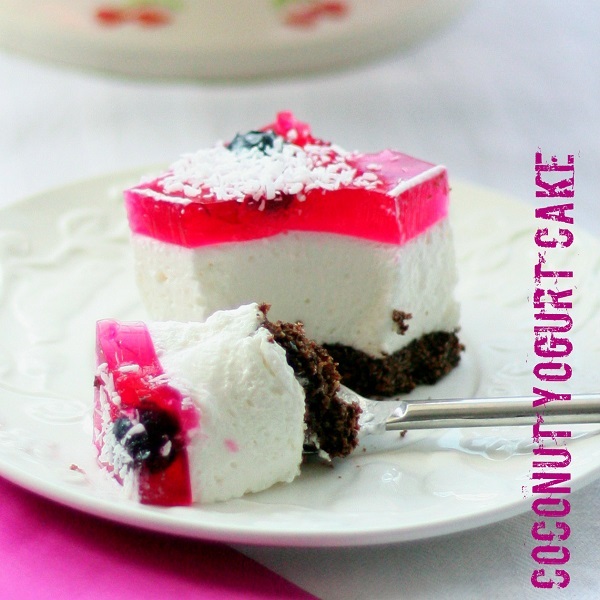 Just imagine soft, cloud like coconut mousse on chocolate base topped with blueberries and jelly. It’s a perfect cake for summer and I can guarantee that you will like it. Preheat oven to 180C. Place all the ingredients for the base in a large bowl and mix well together. Form a bowl from dough and press evenly into 20cm square baking tin (lined with baking paper). Bake for about 10 minutes and set aside to cool down. In mixing bowl place the chilled coconut cream. Beat (using electric mixer) until stiff (note: whipped coconut cream is not as stiff as whipped heavy cream). Add yogurt, spoon after spoon, whisking constantly. Beat at high speed for a few minutes. At the end add the powdered xylitol and coconut essence and beat for further few minutes. Add 2 tbsp. yogurt mixture to dissolved gelatin and mix well. Pour it to the yogurt mixture beating constantly. Prepare jelly and cool it down completely. Arrange blueberries on the set cake and slowly pour the jelly over blueberries. Refrigerate until jelly well set. Hi, I'm new to this kind of cooking but am looking forward to trying these recipes. However, I'm struggling to find some of the ingredients, ie; coconut cream, almond flour, coconut flour, coconut oil. Where can i get them from?